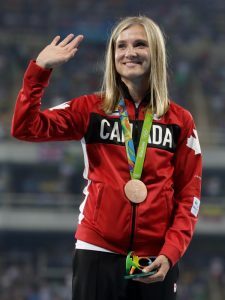 After spending most of her life working harder than most of us can fathom, World Champion Brianne Theisen-Eaton made it to the 2016 Summer Olympics and walked out with a coveted Bronze Medal in Rio. While most of us hope to hit the top of our game at some point in life. Bri did it by the age of 28, with an entire life ahead of her. The question we all face at one point in life and the one that Bri needed to answer was… what in the world do I do next? With a world full of options, the possibilities are literally endless. But a litany of choices brings both doubt and discovery. Today, Bri opens up and shares from her heart how she’s discovering her next steps, her passions and her life calling. This is an extremely enlightening episode that lets us know it’s ok to question things, rediscover your purpose, your passion and not to conform to what the world wants you to do. Now, If you enjoy this podcast, please go on iTunes and review it and give us 5 stars. It’s the main thing Apple looks for when ranking the podcast. And of course, share this with your friends, family and anyone who can receive value from Bri’s discoveries. So with that, please help me welcome Brianne Theisen-Eaton.